FieldWiz is looking to bring professional football analysis to the Sunday League masses with its strategy measuring system for outdoor team sports. For years, professional football players have been wearing tracking devices in training, so their coaches can see who’s in tip-top condition and who’s been out on the beer the night before. Stat Sports’ Viper Pod is used by 17 Premier League teams as well as Barcelona and Juventus, and a host of American football and basketball teams. The trouble is that, at around £4,000 for the system, it’s hardly viable for amateur or even semi-pro teams. That’s where FieldWiz wants to come in. Currently seeking funding on Indiegogo, the Swiss company sees its tracker costing around $200. Pledging $2,900 to the campaign will get you a set of 14 – enough for your whole squad. The FieldWiz tracker attaches to a player’s back, sitting in a dedicated vest, and tracks a range of metrics including distances run, time spent in play, speed variables, acceleration and sprint counts. It’s a similar setup to the miCoach Speed Cell that Adidas offers with selected football boots. The company envisions extra metrics such as heart rate monitoring, ball possession stats and a completed pass count being added to the system in the future. 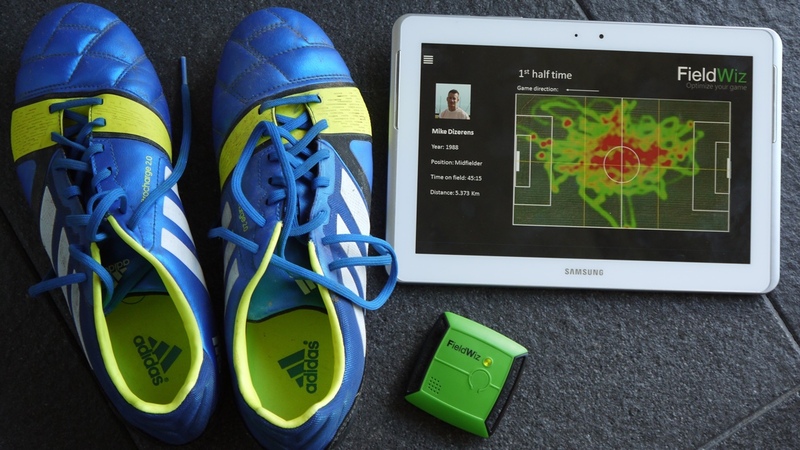 The FieldWiz wearable syncs with a smartphone or tablet using Bluetooth and the data can be used to analyse a player’s performance and to motivate him or her to improve certain aspects of their game. It’s a great idea and, with the International Football Association Board, the body in charge of the laws of the football, in discussions to allow tracking devices to be used during matches – it may well be a perfectly timed one as well. FieldWiz is hoping to ship its devices in April or May next year. You can back the campaign on Indiegogo now.